Interior Views of Collected Visions I at the Houston Center for Photography; horizontal wall images 10x15' and verticals 10x6.9'; top: excerpts from sections I and II; middle: detail from section I; bottom: mid-dissolve excerpt from section III. 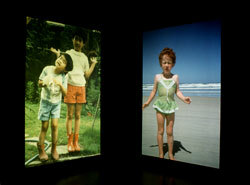 COLLECTED VISIONS I is a three part slide and music installation that examines the representation of women and girls in family photographs. These photographs were collected from approximately 100 women from varied backgrounds and different generations. 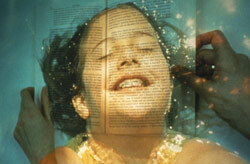 Section I and II are ten minute sequences examining the representation of girlhood and the experience of coming of age. Subtleties of gaze and gesture become clues for how girls find their voices, and the layering of images within and between sequences emphasizes the complexities of representation. In Part I, a woman's hands holding open books about women (such as A Room of One's Own, Little Women, and Writing a Woman's Life) are superimposed over many of the images. 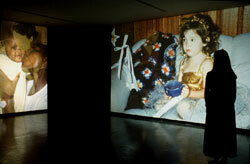 Simultaneously, Section III unfolds in an opposing corner with images dissolving from wall to wall. This 20 minute sequence is a chronological tracing of girls standing before the camera from age one through adolescence. Composer Elizabeth Brown created a score for flute, glass harmonica, cello and viola d'amore. COLLECTED VISIONS I was commissioned by the Houston Center for Photography with funds from the National Endowment for the Arts and was exhibited there in May 1993. A revised version was shown in the exhibition Imaging Families: Images and Voice at the National African American Museum Project at the Smithsonian Institution in Washington D.C., August 1994-February 1995. This slide installation resulted in a faculty grant from the NYU Center for Advanced Technology to Novak that led to the creation of Collected Visions on the Web and the computer-based Collected Visions installation in 2000.